Groundnut is one of the more profitable crops grown by smallholder farmers in Northern Ghana: it has the potential of producing higher incomes than cereals. Growing and processing groundnuts represents a major pro-poor opportunity in Northern Ghana. A labour intensive crop to plant, harvest, shell and dry, groundnuts provide opportunities for the poor to sell their labour. Processing into paste and oil provides income opportunities, especially for women. Ghana is a major producer of groundnuts in West Africa, with nearly all production originating in the North. Rising Ghanaian incomes have pushed demand to exceed production. There is huge potential to expand exports of groundnuts, which are currently minimal. With the control of aflatoxin, the crop could become a major export from the North to regional markets and the attractive European market for nuts. Northern Ghana produces 94% of Ghana’s groundnuts. The crop is produced under rain-fed conditions; the dry post-harvest season in the northern savannah zone is ideal for post-harvest practices. Despite its importance as a subsistence crop, groundnut is one of the most profitable commercialised crops for all farming households. Gross profits for groundnut production stand at GH¢2,449 / ha, making groundnuts second only to Yam in terms of returns per hectare in the North. 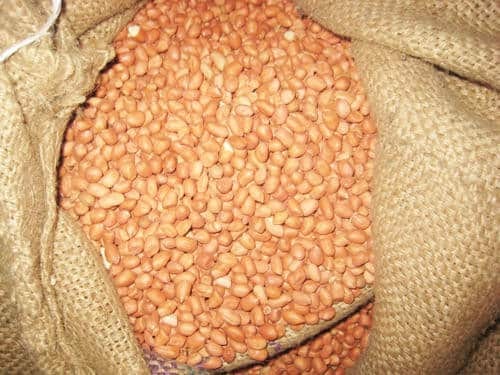 Promote the production of and use of improved seeds by groundnut farmers. Our diagnostic work showed that most farmers recycle groundnut seed from previous harvests rather than purchase newer, higher quality certified seed. Similarly to what we are achieving under our rice intervention, we are facilitating increased private sector involvement in the production of seed of improved varieties of groundnuts. Develop the groundnut supply chain by facilitating linkages between groundnut aggregators and major top of the supply chain buyers. When undertaking the preliminary market screening, it became evident to the MADE team that market information failures and remoteness from markets in the South created huge information asymmetries and power imbalances, resulting in weak linkages between producers in the North and major end markets. MADE is leveraging its market knowledge to broker relationships between top of the supply chain buyers and aggregators in the three northern regions. To ensure aggregators meet the requirements of these major end-buyers MADE is providing them with technical support to improve the improve the quality of the services they deliver to their out-growers, and to ensure effective systems are in place to control for aflatoxin. 200 field days established during the 2015 rainy season, with over 1,500 smallholder farmers trained on GAP. Partnerships agreed with 5 aggregators with an outreach of 5,200 smallholder farmers.